Yale Door and Window Solutions has linked up with Britelite to sponsor a special Keyfree competition at the iconic Ideal Home Show. Visitors to Britelite’s stand IM30 will be presented with a free card featuring a code, which if presented to Keyfree and it opens, will instantly win a new composite front door with Keyfree already installed. Yale Door and Window Solutions has sponsored the competition to enable six winning Keyfree opportunities at the 18 day show, taking place at Earl’s Court London, from the 15th March to 1st April 2013. 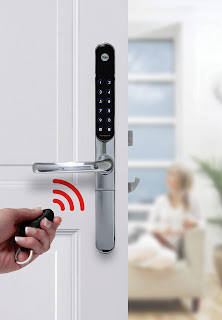 Yale Keyfree is the very latest in door security from Yale Door and Window Solutions, combining peace of mind with convenience by allowing key less access to a home without compromising on the safety and protection of the property. For more information on Keyfree, please visit www.yaledws.co.uk or visit Britelite’s stand 1M30 at the Ideal Home Show, taking place between 15th March and 1st April at Earl’s Court, London.